You've got your variable dent reed and now you find you want more sections. Choose the size you want from the drop down menu. Use them alone or on a loom. Schacht has developed a card that, at 3.5 inches square, is comfortable in the hand without being bulky. Colored bands and stripes are printed along each edge as an aid in keeping track of the card�s position. Made of sturdy yet flexible 24-point card stock, these cards will serve you well over many, many warps. Over the years, there are have been some design changes to the Trestle Stand. If you have a Flip loom (or a non folding old style Rigid Heddle from Schacht) that is older than 2-17-10 you will need this kit to make all the parts of the trestle stand work. This is a kit to drill out the arms so that they will fit your loom. In stock ships from Maine. If we should run we can backorder and drop ship from the factory. Their lead time is 2-4 weeks. 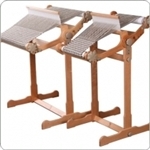 Glimakra Emilia Second Heddle Brackets for the 13 or 19 inch Rigid Heddle Loom The Flip Trap gives you a convenient yet still portable place to set your tools while weaving. The Flip Trap installs into the ends of the loom sides, using the same holes as the clamps. The pictures show it attached to a 25 inch Flip and a trestle stand, in use holding the shuttles. In stock ships from Maine. If we should run we can backorder and drop ship from the factory. Their lead time is 2-4 weeks. Heddles for the Flip (folding Rigid Heddle Loom) - 15 Inch. Available in 5, 8, 10, and 12 dent. Ship from factory if not in stock in Maine. Generally a 1-2 week lead time. The Flip Trap gives you a convenient yet still portable place to set your tools while weaving. The Flip Trap installs into the ends of the loom sides, using the same holes as the clamps. The Flip Trap gives you a convenient yet still portable place to set your tools while weaving. The Flip Trap installs into the ends of the loom sides, using the same holes as the clamps. In stock ships from Maine. If we should run we can backorder and drop ship from the factory. Their lead time is 2-4 weeks. The Zoom Loom is our newly designed 4 x 4 pin loom. It features a sloping interior edge that effortlessly guides the weaving needle. For comfort we added graceful extended sides that are easy to hold. Additionally, we added molded-in instructions on the front and back for quick reference. A handy slot holds the beginning yarn without knotting. Small and compact the Zoom Loom is easy to take along to weave anytime, anywhere. Made in the USA. Kit includes: 1�4 x 4 Zoom Loom, 1�6� weaving needle, 1�3� tapestry needle, full color instruction booklet with 3 patterns. This is the perfect tool if you just want to make little squares or if you want to make samples for larger weavings. CLICK HERE to see Schacht's Youtube video on how to work with this little loom. Heddles for the Flip (folding Rigid Heddle Loom) - 20 inch. Available in 5, 8, 10, and 12 dent. 13.5 inch heddle for the Emilia Rigid Heddle Loom. think of lots of other uses as well. Carry your flip easily folded in this bag. Has pockets and is made of a durable material. 2 carry handles on the top and one detachable shoulder strap. Very handy bag to have if you like to move around with your Flip. 27 inch heddle for the Susanna Rigid Heddle Loom. Ship from factory if not in stock in Maine. Generally a 1-2 week lead time. The Cricket Loom Bag makes your Cricket even more convenient to carry. The Cricket fits sideways into the bag with room for accessories. The outside pocket provides a place for a magazine or additional accessories. These bags are especially woven for Schacht in Guatemala by Myan hands. The 15 will also fit in this bag, some of it will jsut stick out. CHOOSE YOUR COLOR The Cricket Loom Bag makes your Cricket even more convenient to carry. The Cricket fits sideways into the bag with room for accessories. The outside pocket provides a place for a magazine or additional accessories. These bags are especially woven for Schacht in Guatemala by Myan hands. The 10 will also fit in this bag, but it will be pretty roomy. The Inkle Loom is a loom every weaver should have. It is great for weaving belts and bands. Inkle looms are great for start-up weaving programs because they require little additional equipment, are easy to use and understand, and are easily stored. Schacht's Inkle loom is built with years of heavy use in mind. It has one open side for ease of warping. The tension bar has an easy grip knob for adjusting the warp tension during weaving. Warps can be up to 4.5" wide and 8.5' long. 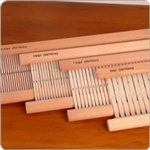 The Inkle Loom is made of hard maple and left unfinished. In stock ships from Maine. If we should run we can backorder and drop ship from the factory. Their lead time is 2-4 weeks. Reeds are available for differing yarns. The 2.5, 5, 7.5 and 10dpi (10, 20, 30 and 40/10cm) reeds feature the wide eye for novelty yarns. The fine 12.5dpi (50/10cm) and the NEW extra fine 15dpi (60/10) reeds are also available. Made from strong, durable nylon with Silver Beech rails. These are not in stock but will ship to you once they arrive from Ashford. Please plan on 1-2 weeks before shipment. Reeds are available for differing yarns. The 2.5, 5, 7.5 and 10dpi (10, 20, 30 and 40/10cm) reeds feature the wide eye for novelty yarns. The fine 12.5dpi (50/10cm) and the NEW extra fine 15dpi (60/10) reeds are also available. Made from strong, durable nylon with Silver Beech rails. These are not in stock but will ship to you once they arrive from Ashford. Please plan on 1-2 weeks before shipment. Legs/Stand so you can use it anywhere when you don't have a table handy. Ship from factory if not in stock in Maine. Generally a 1-2 week lead time. The Cricket Floor Stand makes it easier than ever to use your Cricket Loom. It's simple to put your Cricket on the stand and adjust the angle, and it's quick to remove when you want to take your Cricket out on the town.